Philadelphia has a rich history in book production and its book collections are strong. Until now, Philadelphia did not have an institution devoted to book artists and the book arts. Collaborating with public and private book-collecting institutions throughout the city, Philadelphia Center for the Book brings together book artists, librarians, educators, and the public to appreciate the book as a contemporary art form within the context of its historical antecedents. 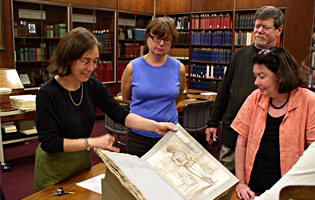 Philadelphia Center for the Book facilitates exhibits, workshops, and book fairs, as well as collaborations with Philadelphia-area special collections libraries. Our quarterly members and friends meetings are open to anyone interested in learning more about the organization. Hosted by local special collections libraries, universities, and cultural institutions, meetings begin with a presentation by the librarian of some favorite items in the collection. The presentation is followed by discussion of Center for the Book activities.